Social media has been established as one of the key channels of the modern day marketing mix. However, for some industries like Pharma, the number of regulations around publishing content makes maintaining a solid social media presence complex. We’ve tracked the trends in the pharma industry and best practices for social content publishers. In this piece, we specifically look at metrics, content, and campaigns of 15 brands. Brands Analyzed: Abbvie, Allergan, AstraZeneca, Bayer, Boehringer Ingelheim, Bristol-Myers Squibb, Eli Lilly & Company, GSK, Johnson & Johnson, Merck, Novartis, Novo Nordisk, Pfizer, Roche, Sanofi. Given the stringent regulations in the industry, many brands have even opted out of having a presence on some social networks. 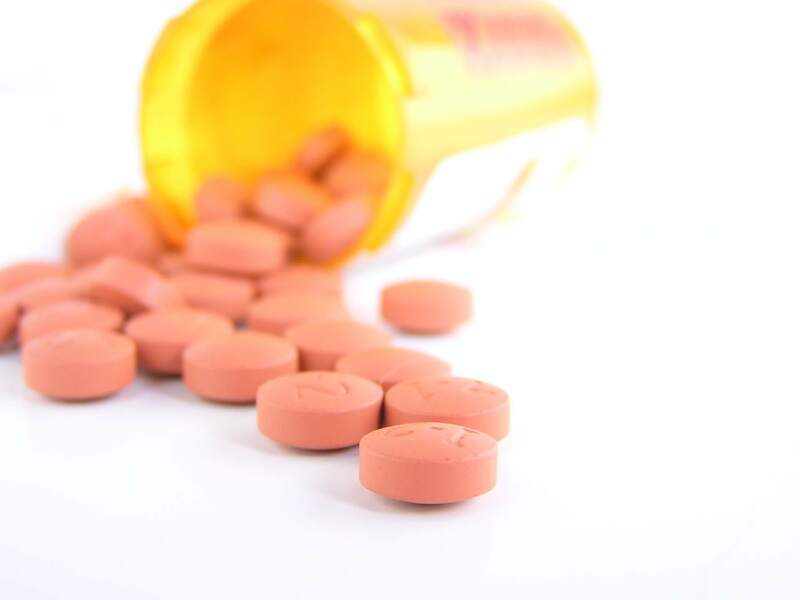 The social networks themselves enforce certain rules and restrictions for pharma companies. For example, Abbvie doesn’t have a corporate Facebook page though they have a careers page on the social network. Similarly few of the brands put efforts into only certain channels. Except for Bayer, Novartis and a few others, many brands chose to not be active on Instagram. Bayer has the largest number of Facebook Fans while Novartis leads on the Follower front on Twitter and Instagram. Pfizer on the other hand seems to have the biggest audience base on LinkedIn. Though fan base is an important social media metric, a better indication of the brand’s performance is their ability to expand the base, i.e growth rate. Merck had the highest growth rate of 56% on Facebook and Allergan was the brand to grow fastest on Twitter, at a rate of 28%. Very often, frequency of posting is thought to have an effect on engagement. The newsfeed structure of social networks demands that marketers be smart to get their content visibility. However, this has more to do with content, posting schedules and demographic research than posting frequency. 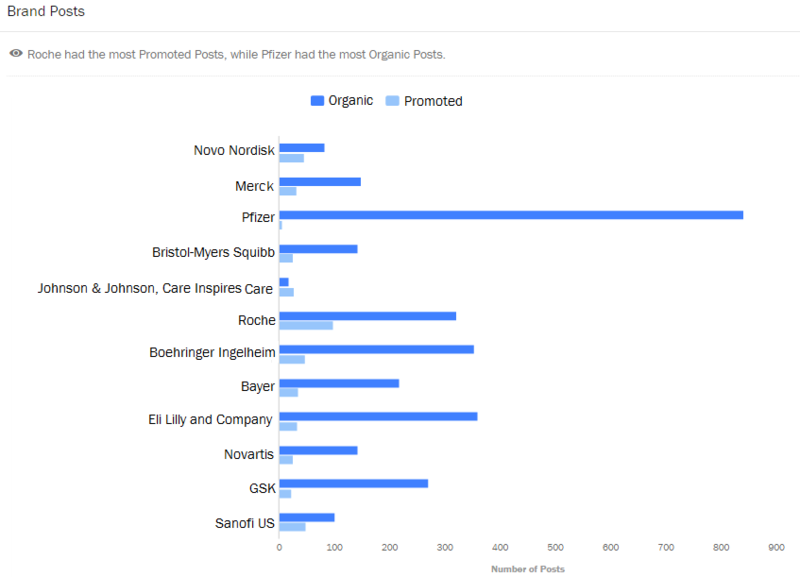 For example, on Instagram, even though Eli Lilly posted the most, Bayer received the highest engagement. Unmetric’s Engagement Score takes into account both interactions and your community size so you are comparing content on an even ground. However, knowing your own score only tells you so much. Benchmarking against the industry and other brands gives your own metrics more context. 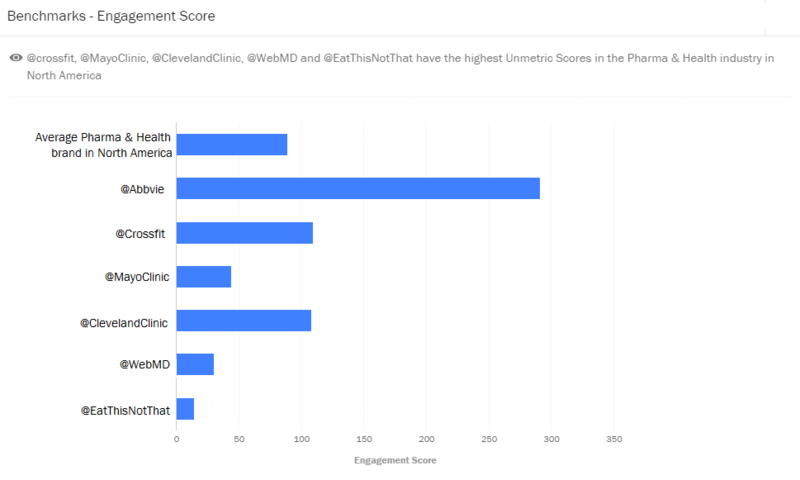 Amongst the 15 brands analyzed, Abbvie has the highest Engagement Score of 291 on Twitter. To understand how that stacks up against the larger universe of other pharma companies, let’s benchmark this score. Turns out Abbvie is outperforming the industry and is well above average. While engagement is primarily a measure of interactions like Likes, Comments, and Shares, one of the other biggest performance markers is the Reach and Impressions a post gets. Unmetric can estimate the Reach and Impressions any brand received on Facebook – at both page and post level. 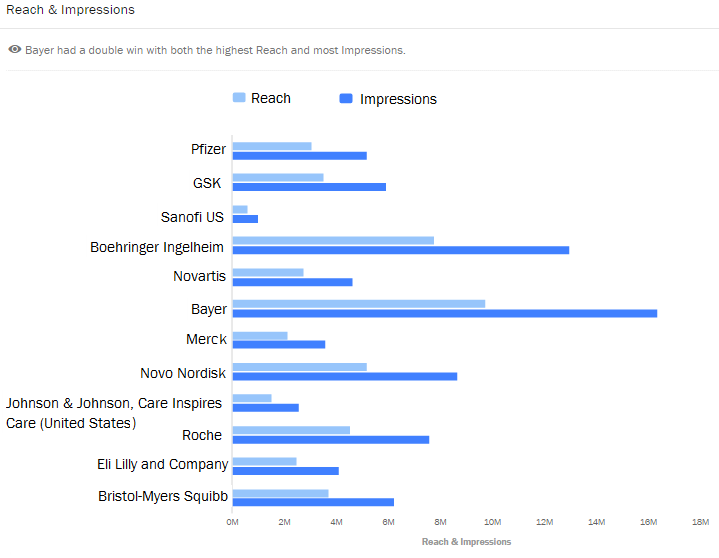 Bayer had the highest Reach and Impressions. One of the key factors that can affect these metrics is promotion. How do you know a brand’s stellar performance is because of amazing content and strategy or because of sponsorship? Unmetric can detect when a post has been promoted and we’ll tell you when paid efforts were involved. We’ll also tell you how that promotion fared in terms of engagement. Though Bayer promotes a portion of their content, it looks like there are other brands that put in way more paid efforts. These brands didn’t let the content regulations stop them from putting out creative and engaging content. Take a look at a few of the posts that really struck a chord with fans. Bayer’s created this simple post that shows their cross from a roof. The brand smartly used the 360-degree photo feature of Facebook to make the post more exciting. It resulted in them getting over 60,000 Likes! In this post, the company is addressing a major concern and bringing to light their action plan. Though the brand is tackling a serious subject like Brain Awareness Week, the addition of a puzzle that ties in with the topic, makes the post relatable to all types of audience. The post is one of the best performers in the industry. Marketing is experiencing a shift towards making brands more human. Portraying the human side of your brand, or even better showcasing the people behind your brand, makes your brand more relatable. This post from Novartis that brings to light the real people that are a part of a new initiative engaged best for the brand. Any social media marketing team must stay coordinated to maximize social performance. The content creator needs to work in close association with the strategist who in turn needs to take inputs from the analyst. While the process can either start with analytics and end in publishing or can happen the other way round, the key stages when it comes to social media is analyzing performance, framing strategy and creating content. Before creating content, it’s important to understand the demographics and composition of your community. This will help you create content that your audience will appreciate. Additionally, doing an analysis of historic content will show you what worked with your audience in the past. Boehringer Ingelheim’s fans seem to mostly be young men. The brand would benefit by customizing content to appeal to this demographic. Another factor that plays a large part in strategy is timing. Once you know who your audience are, let data tell you when they’re most active and receptive to content from your brand. Though Roche posts the most on Fridays, they seem to get the best engagement on Saturdays which is when they seem to post the least. A set posting schedule isn’t the end of planning for publishing. Aside from proactive content, interacting with fans and replying to their questions is a key part of social media marketing. In 2016, Bayer seems to have gotten over 40,000 @mentions on Twitter. 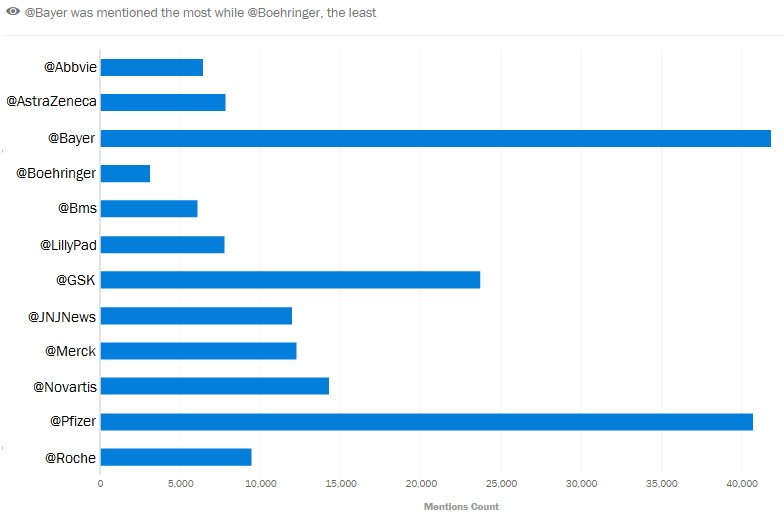 Eli Lilly and Company replied to the largest percentage of mentions while Astra Zeneca replied the fastest. The most common type of reply from all these brands was to provide a number and ask to be contacted. Replying on social media could be for customer service or could go beyond and establish a personal relationship with your followers. Novartis helped out consumers that had questions. Boehringer replied to this tweet about a cause they support and showed their appreciation. Social media marketing is evolving and brands from all industries – even those with many regulations – are embracing it. While creating great content is large part of social media, the key to improving performance is to keep measuring owned efforts and benchmarking it against competitors. Unmetric helps brands like Ford, GM, and NARS do exactly that. Sign up for a demo and we’ll show you how.